Welcome to Sea's the Day! This beautiful two bedroom condo is located on the 13th floor and provides spectacular views from the South balcony. The décor is peaceful, fresh and uncluttered for a totally relaxing vacation. The balcony overlooks a most amazing view of the Gulf of Mexico, the sandy Destin beach, three sparkling blue swimming pools below and the boardwalk access to the beach. Created with you in mind, this luxury two bedroom condominium located in Ariel Dunes II is available for you now. You, along with your family and guests will be amazed at the level of comfort in this beautifully decorated condo. Come and experience the Ariel Dunes ll difference! Entertain special friends and family members in the sleekly appointed family room with a flat-screen LCD television . There is a comfortable pull-out sofa that offers additional sleeping accommodations. With a second sofa there is plenty of room to relax after a hard day of fun in the sun. You will welcome the relaxation and comfort that our condo provides along with spectacular views from the South balcony. 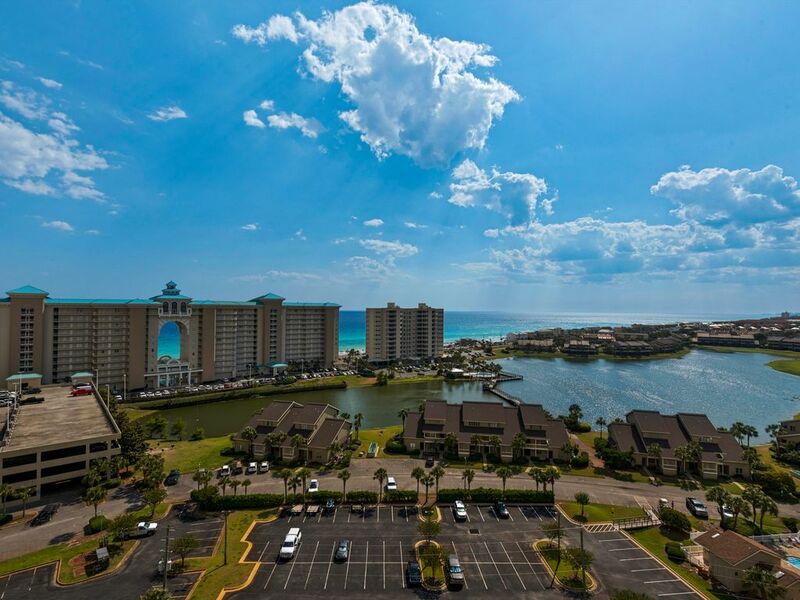 With breathtaking views of the Gulf and the Bay our condo is also just a short walk to the beach. Our condo has an open floor plan with two bedrooms and a bonus bunkroom. The master bedroom has a king size bed with access to the balcony and views of the gulf. The second bedroom has a queen bed w/ attached bath. The bonus bunkroom has a set of bunkbeds and a view of the golf course and bay. This calming and open floor plan also features a beautiful kitchen with granite countertops and G.E. Profile appliances. You will feel right at home with plenty of room to relax and enjoy the beautiful views from every window. You will also have access to 11,000 sq ft of pools, a 18 hole championship golf course, 8 tennis courts and access to 2,000 sq. ft. of snow white sandy beaches. Shop till you drop! : The Silver Sands Outlet Mall is a vacation in it’s own right for shoppers you will have access to over 100 stores, including, Polo, Ralph Lauren, Banana Republic, Brooks Brothers, Eddie Bauer, Liz Claiborne, Tommy Hilfiger, Lenox, Nike and Reebok - just to name a few. When you need to pause for nourishment choose from Panera Bread, Cheeseburger in Paradise or Carrabba's Italian Grill. (3) There is a flat sreen tv in the living room, master bedroom and the guest bedroom. We enjoyed the condo a lot. Everything was as advertised. Great views from balcony. Enjoyed our stay and would stay here again. Thx for a great week in Florida! Wonderful place to stay for our family of 6! It was our first time visiting the area and we had a great time! Thank you for the lovely review! I am so pleased that you enjoyed your stay and we look forward to hearing from you again! The condo itself was comfortable and well equipped and offered a beautiful view of the Gulf and some memorable sunsets. Kathy was terrific in taking care of the logistics with respect to checking in and out, parking passes, wrist bands, etc. and was always there to answer on the few occasions we called with questions. We felt we got a good value for money, and would definitely consider returning for another stay if the price remains affordable. Thank you for taking the time to write this review! I am so pleased that you enjoyed your stay and I hope you will come back to visit us again soon! Loved our accommodations! The property itself such as the cafe and golf area needs some updating but the Seascape is centrally locates with lots of restaurants to choose from! Access to the beach is within a 10 min walk and pools are available till 10 pm and one of them is heated! We were there during spring break for college but there was no problem with that! Again, loved our place! Highly recommend it to anyone! I am so pleased that you enjoyed your stay! I will let the association know about the feedback on the cafe and golf course! I hope we see you again soon! The suite was great, well furnished, well equipped, and very clean. We enjoyed the view. The view was better than the one we had in Ariel Dunes 1 which was on the 14 th floor, we had been there for over 10 years. The move to 1302 in Dunes 2 was very pleasant. Our Agent Kathy has been with us for several years now, and she and her husband Mike are class acts. Whenever there is a problem or question they are readily available. Our only concern this year was the area carpet in the living room, it is breaking up. We are looking forward to our return visit next January and February. Thank you for the lovely review! I am so pleased that you enjoyed your stay at Seas the Day! We agree that area rug that was purchased a year ago, though was very pretty, it did not hold up well at all. We have removed it! Excellent property with a great location. We had a great time at the condo unit. The unit has a great view of the beach and is very convenient to restaurants and shopping. The unit was very clean when we arrived with everything we needed. We were allowed to check in early which was greatly appreciated. I would recommend this unit to anyone wanting to spend time in the Destin area. Thank you for taking the time to write this lovely review! I am so pleased that you enjoyed your stay and I hope you will come back again soon!!! Golf: Dont forget our wonderful Golf courses!